Four people have been arrested in Morgan, Georgia after allegedly trying to sneak contraband into a prison with a small remote-controlled helicopter. WALB's Diane Dean reports. Armed drones deal death from the skies in remote regions of Pakistan and Yemen, but a group of drone operators has failed in an attempt to use an unmanned craft to drop a deadly substance into a South Georgia prison. Four people were arrested in Morgan, Ga. last week after a corrections officer at Calhoun State Prison saw a small remote-controlled helicopter hovering over the prison yard, apparently attempting to deliver something to inmates. According to Calhoun County Sheriff Josh Hilton, after an hour-long search, deputies saw a black Dodge with plates from Gwinnett County on a street in nearby Morgan. Gwinnett County is in suburban Atlanta, more than 200 miles north the prison. "After we gained consent to search the car, we found the helicopter and I don't know exactly how much it was but probably about one or two pounds of tobacco rolled up," Hilton told WALB-TV, the NBC News affiliate in Albany, Ga. The six-rotor helicopter was found with a Spektrum DX-6i remote control transmitter and a pair of binoculars, which authorities believe were meant to be used to watch the craft as it flew over the prison to deliver tobacco. Authorities allege that the suspects were planning to call their intended customers to arrange for a drop of the plastic-wrapped bundles. 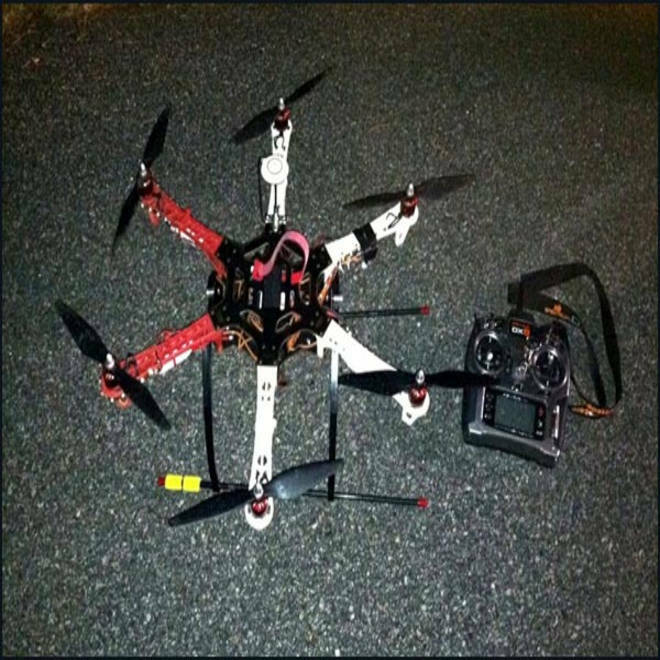 The remote-controlled helicopter found in a car near Calhoun State Prison. Calls to the Calhoun County Sheriff’s Department and the Calhoun State Prison were not immediately returned. The prison is a medium-security facility that houses more than 1,500 inmates.